It’s a nondescript August afternoon in the sleepy North County beach town of Encinitas. On the city’s main street, a handful of surfers plod across the 101, but there’s not much else brewing in town -- that is, except for the line of cars pouring out of a newly finished lot on Santa Fe Drive. Bumper-to-bumper traffic lines up to the I-5 off-ramp, and a growing crowd of pedestrians spills out of the lot and begins to wrap around the block. It would be one thing if this mass of people was gathered because Pope’s in town, but the reality is even more remarkable: they’re lined up for a vegan fast food burger. The Encinitas location is the second Plant Power to come to the San Diego area, with the first spot landing in Ocean Beach in 2016 -- and in Vouga’s vision, it won’t be the last. The goal is to open 10 new Plant Power franchises in the next one-to-three years, up and down the California coast, with locations set to open in Redlands and Long Beach later this year. 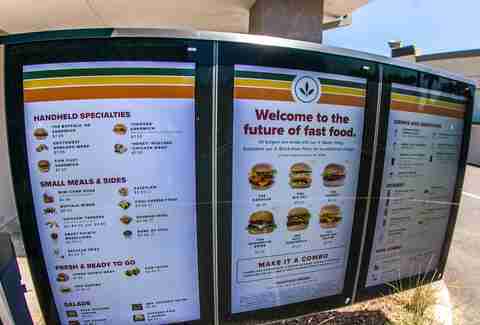 The menu and layout of Plant Power resemble a hybrid combination of Shake Shack and McDonald’s (the store’s co-owner, Jeffrey Harris, even goes so far as to call it a “vegan McDonald’s”). Customers can order everything from a “Fish” Filet Sandwich to The Big Zac -- a humbly-named vegan cousin to the Big Mac -- and wash it all down with thick “milkshakes” made from almond milk. For Vouga, it was important that Plant Power not put off a holier-than-thou vibe about the vegan offerings. 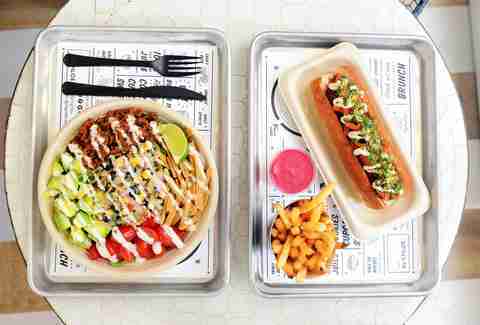 The mixture of fast food that isn’t terrible for your health with straightforward messaging that isn’t preachy or smarmy seems to have struck a chord in San Diego, a city that takes its burgers seriously and its fitness even more seriously. And it may be the key to starting the next big national trend in dining. Right now, it looks Vouga might be onto something. 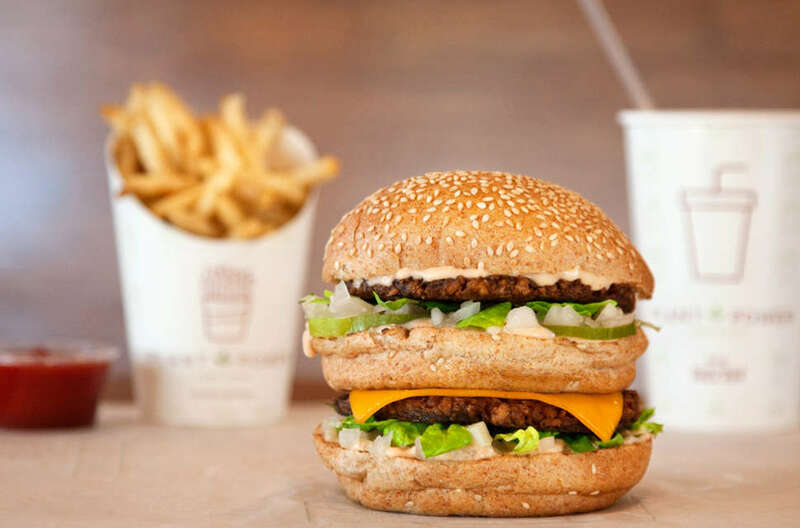 Across the nation, vegan and vegetarian fast food options are popping up with increasing frequency. Up in northern California, Amy’s Drive Thru has become a staple in Sonoma County and is looking to expand to Marin County soon, while out on the East coast, chic vegan spot By Chloe has grown from its original store in New York City’s Greenwich Village to 11 locations that include spots in Boston, Los Angeles, Providence, and London. By Chloe is a sterling case study in Vouga’s belief that vegan fast food chains can represent a “paradigm shift” in the eating habits of the nation. 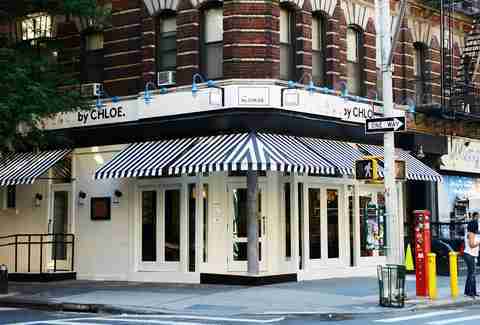 Between their opening in July of 2015 and today, By Chloe has served over 1.2 million customers and more than 600,000 vegan burgers. Wasser says the demand for By Chloe’s growth is massive right now, and that she is beset by emails and requests from people on social media to expand to new markets. Despite that interest, though, small towns and college areas may ultimately present the hardest markets for the vegan fast food expansion. Due to the way the food for By Chloe and Plant Power is sourced and made, the average meal at both will cost more than the equivalent at traditional fast food joints. Wasserman says By Chloe customers can expect to pay about $10-12 for a sandwich at the chain and about $3 for a drink, whereas Plant Power visitors can expect to pay $8 for a burger and $2 for a drink. In lower-income areas, that may fly. But Vouga has plans for reaching a larger customer base with more affordable prices.